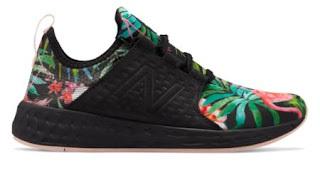 Today ONLY (9/2), these Women's New Balance Running Shoes for $39.99 (Retail $89.99). Slip on our Fresh Foam Cruz Paradise women's running shoe and go. Crafted from stretchy knit on luxurious Fresh Foam cushioning, this shoe delivers effortless, all-day comfort. The two-way stretch flat knit upper features an adjustable midfoot saddle for a custom-like fit, while molded foam at heel delivers superior comfort.